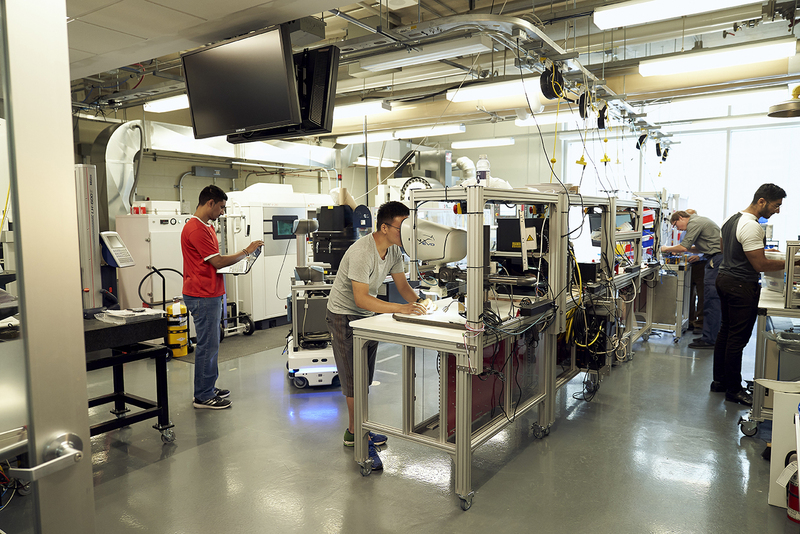 The facility, located in the basement of the Engineering Technology Building, introduces advanced manufacturing technologies to students and industry partners and provides the opportunity to work on hands-on projects to improve individual manufacturing processes. The Learning Factory is arranged in several different manufacturing and post-processing stations. The manufacturing stations have equipment for metal additive manufacturing, CNC machine tooling, 3D printing, injection moulding, laser cutting and electronics. For post-processing there are stations for marking and tracing information about an item with a 2D bar code reader, assembly of mechanical and electronics components with two collaborative robots and a station for packaging and testing. Each station is equipped with a radio frequency identification (RFID) reader, which collects data to optimize a manufacturing process. Items that are built also carry chips that hold data relevant to their production. Fourth year B.Tech Automation Engineering Technology student, Amy Hasselman, worked with YuMi, a collaborative robot, inside the Learning Factory. She used the robot to assemble a handheld electric screwdriver from scratch. YuMi uses a vision system on its wrist to take pictures and assemble parts. Vince Guglielmo, vice president, Automotive Parts Manufacturers says that industry can improve their own practices by partnering with students in the Learning Factory.